This is a Hawaiian Tank Long Dress. It could be worn for both casual or formal. Measurements of the size chart are for the dress. Please add 2-4 inches (5-10cm) to your body measurements when selecting your size. [Bust]: Measure from armpit seam to armpit seam across the back, and multiply by two. [Waist]: Measure the waist 8 inches under the bust, and multiply by two. [Hip]: Measure the hip 8 inches under the waist, and multiply by two. [Length]: Length from top of a shoulder to hem. 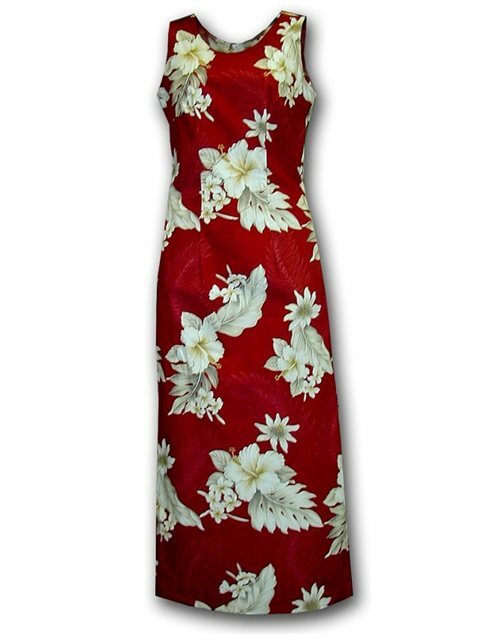 Red Long Tuberose Clip 6"
I loved this dress and wore it to a Jimmy Buffet theme party. I received many compliments. The dress is made well. The sizing is a little small so I ordered one size up and it fit perfectly. This dress is just as I expected. Good quality, colors vibrant and fit just right !!! To match my husbands shirt! Love it! My fiance looks really good in this long dress. Was excellent quality and it fit very well.